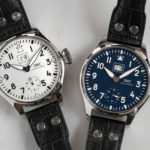 For the first time to celebrate 150 years of IWC in 2018, the Big Pilot features date display featuring large numerals. In a stainless steel case, with a blue lacquered finish dial, and blued hands. 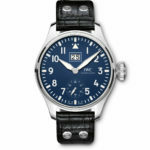 It is powered by the hand-wound IWC-manufactured 59235 calibre with a power reserve of 8 days. The large date display consists of two discs, the first disc shows the tens, the second one the single digits. The power reserve display has been transferred to the back and the soft-iron inner case to protect against magnetic fields, is fitted with a porthole.